Awards were given Saturday at the Antique & Classic Boat Rendezvous in multiple categories. Mystic Seaport would like to congratulate all of the winners and thank everyone who brought their boat to the event. Chris Craft delivered this boat to Bogie Marine at Candlewood Lake, CT in 1959. As the second owner, the Haupt family purchased this boat in 1969 for daily use as a family ski boat and sunset cruises in the summer months at Twin Lakes, Salisbury, Ct. Since 1970, we slalom- and barefoot-water skied behind her very nice wake! She goes over 42 mph and still pulls skiers today. Each spring, the Haupt family (two generations now) maintained this boat with countless hours of caulking and painting the bottom, sanding and varnishing while learning about maintenance of the Chevrolet V8-283 engine. Restored in 2015 by Jim Murdock’s team at Vintage Restorations in Bristol, CT to preserve our family memories, good times and sweat equity while keeping an OLD TIMER going for another generation or two. This 1956 15’ Century Palomino was originally purchased by a Commander in the Navy from Bethesda, Maryland. He owned her and kept her in that area until 2008 when the current owners purchased her. New white oak battens were steamed and installed. All fittings were re-chromed. New upholstery was completed. The decks and hull were stained and twelve coats of varnish were applied. The 1957 electric start Johnson Golden Javelin outboard motor was rebuilt and repainted to factory specifications. The boat was re-launched in 2015 in time for the Antique and Classic Boat Society’s show in Essex, CT. She was awarded Best in Show in the Preserved category. In the same year at the Antique Boat Show in Lake Champlain, VT, she received the Best in Show in the Outboard category. NISCA is an Ojibwa word for “goose”. She is a 40′ 1924 Express Cruiser from the William Hand, Jr. Collection, built on the Connecticut River at the Portland Yacht Yard, and has remained afloat in Connecticut waters for most of her years, apart from an excursion to Florida in 1987 by transport, and again on her own bottom in 1995. Her present owners purchased her in 1988 and the restoration began in the spring of 1989. NISCA was out of the water for five years and returned in 1994 with a new keel, stem, one hundred ribs, floor timbers, and engine mounts. NISCA originally had an open main saloon with a pipe frames and canvas top. Previous owners replaced this structure with an enclosed cabin, probably sometime in the 1930’s. Later in the late 40’s to early 50’s, the 1930’s cabin was replaced by a 1950’s-style house, which was not in character with her William Hand design. The present owners removed the 1950’s-style house and replaced it with what they believe her 1930’s cabin would have looked like. NISCA’s original power was a single 200 hp. Van Blerck gasoline engine. Today, NISCA has a top speed of 18.7 mph (16.4 knots). The boat weighs 17,000 pounds (7.6 L tons) and has a cruising rate of 500 miles when fully provisioned. Best Classic Powerboat <45 feet: Owner maintained with special mention for excellent engineering to include modern safety and navigation equipment while preserving the original layout and maintaining the original spirit and feel. 1964 Rybovich – Sam V, Bob Melton. SAM V is a custom built sport fisherman that was commissioned as FRISKY LADY for John Willis in 1964. Over the last 53 years, she has been continuously maintained in “Palm Beach” (like new) condition. Under the current owner, since 2000, the boat has cruised extensively on the East Coast and has won “Best in Show” at the Antique and Classic Show in St. Michael’s, MD, and at Vintage Weekend at Ocean Reef. TRADE WIND was originally built in 1938 for a discerning owner who wanted an elegant floating home. She was built solidly of teak on steam-bent oak frames, and was the first pleasure boat to ever be tank-tested. She was used as a tender to the Bermuda racing fleet in 1938 and after World War II served as a research vessel for sonar and radar. 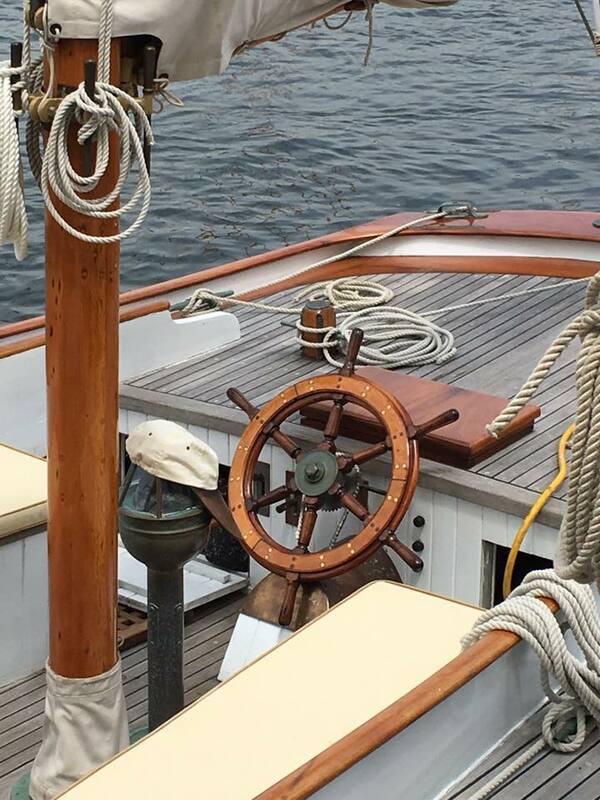 An extensive restoration was done by Rockport Marine in Maine, from 2008-2011.The restored TRADE WIND is well-appointed in paneled iroko, a tropical hardwood. She has a generous galley, three heads, a bathtub, and a main salon with a fireplace. The engine room is equipped with two restored Detroit 671 engines, a generator and a watermaker. Rockport Marine also built a new ketch rig for the boat with custom bronze hardware and sails by Nat Wilson. She has been privately owned from 1975-present. She served as a committee boat for the Eggemoggin Reach Regatta in 2011 and 2012 and won several restoration prizes at the WoodenBoat Show in 2011 and 2012 and at the Salem Boat Show in 2013. She recently had all of her deck brightwork revarnished. CORSAIR was maintained by her designer, Tom Rybovich, until 1990. She is an early example of composite wood construction. The boat is single-plank, epoxy-coated wood on sides, and double-planked, epoxy-coated and sheathed in fiberglass on the bottom. She still has her original planks, ribs, frames, and fasteners. She was owned for a period of time by Emil Rybovich and was kept at the Huckins Yard until 2001 when she was moved north by her present owner. Paint and portions of her interior were renewed by Ted Hood and Hinckley in Rhode Island. The owner does yearly varnish and teak maintenance and routine engine maintenance. Best small sailing vessel: Varuna, Peter Dinkel. Owner Maintained to a high level while keeping the vessel practical and usable. VARUNA has been cared for by the current owners since 2005 and is moored in Dering Harbor, Shelter Island, NY. VARUNA was formerly called MARIANN and sailed out of American Yacht Club in Rye, NY, and Nantucket under the past owner’s care from her launch in 1962, until 2005. VARUNA does annual cruises in southern New England waters, to Maine in 2012, and most importantly, numerous overnights with grandchildren. VARUNA has participated in a number of regattas including the New York Yacht Club Classic Regatta, Greenport Classic Regatta, Shelter Island Yacht Club races, and Off Soundings, winning numerous trophies. 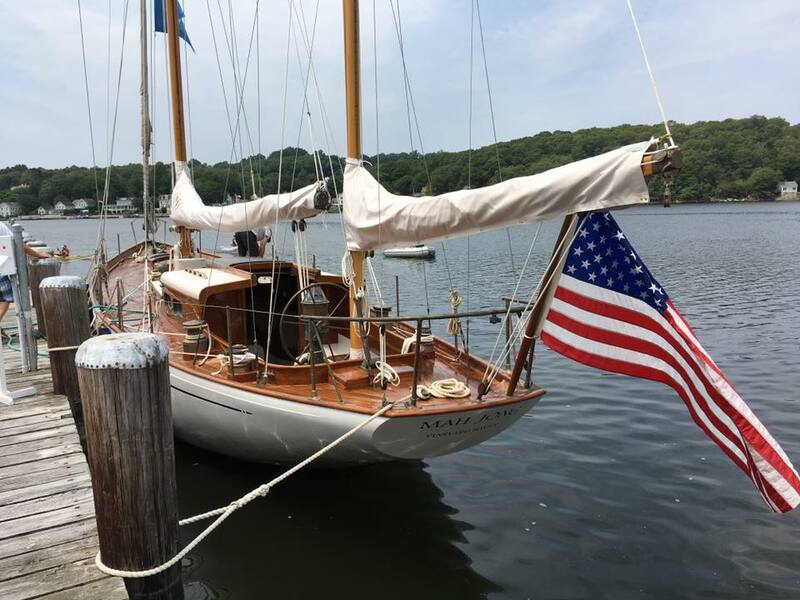 Fully restored and repowered by present owner at Rockport Marine, FIDELIO was originally built for Castine, Maine yachtsman, Vale Marvin, and delivered to him in Castine following delivery to New York from Germany. She cruised and raced the waters of central Maine coast for years, spent a brief period in California, then returned to Rockport, where the current owner purchased her seven years ago. She is the second yawl built from the original FINISTERRE plans by Sparkman & Stephens and is considered to be her identical twin. Her racing record over the last six years confirms that. Like FINISTERRE, FIDELIO has distinguished herself on race courses from Maine to Rhode Island, and is almost unbeatable in a moderate breeze. She won the first Maine Retired Sea Captains Regatta over 50 years ago in Castine and also won the 50th anniversary of that very special event four years ago. family. During World War ll, the vessel was used by the US Navy in the Atlantic Patrol. After WW II, the vessel was donated to Tabor Academy where she served as Tabor Boy until 1954. Dr. George Brooks owned the vessel for 51 years and during that time made numerous visits to Mystic Seaport. The 2006 restoration relied on the Sparkman & Stephens plans archived at Mystic Seaport. A great effort was made to keep the original concept/design and use traditional materials. BLACK WATCH won first in class in the 2012 Newport Bermuda Race and has won numerous victories on the classic race circuit. CHAUTAUQUA was launched at the Willis Reid yard in Winthrop, MA in 1928. The name translates from the Seneca Indian word meaning “source of life” for the lake they lived along, and was chosen by the previous owner for the place where he and his family spent their summer. Designed by SS Crocker, design #106, she was built by Willis J. Reid Boat Builders of Winthrop, MA, in 1928 for Alfred Olds, a tobacco wholesale distributor and grower from Windsor, CT. With their son off to medical school, Mr. Olds commissioned the design to be easily sailed by him, his wife, and two children. 2017 marks this current caretaker’s 40th year sailing CHAUTAUQUA. Rebuilds have occurred in the early ’60s and again during the winter of 2000-2001. The most recent rebuild followed Sam Crocker’s original drawings and photographs. Every effort was made to bring CHAUTAUQUA back to her original layout, both above and below deck. This detail has been followed to the upholstery seating “tuck and buttoned” design. BOLERO was designed by Sparkman & Stevens to Cruising Club of America rules, and was, at the time of her launch in 1950, the largest-size yacht that could qualify for major ocean races. Her original owner was John Nicholas Brown, then Vice Commodore of the NYYC. Bolero’s racing career includes “First to Finish” in the Bermuda races of 1950, 1954 and 1956. In the 1956 race, she set an elapsed-time record of 64 hours, 17 minutes, which she held until for 18 years. She is framed in oak, with double planking of cedar and mahogany and cedar decks. An extensive restoration was completed by Rockport Marine in 2010. COURAGEOUS was built for Arthur Iselin, whose uncle was in syndicate for America’s Cup defense in the 1880’s. Arthur was involved in the Courageous 12 meter syndicate for the 1970 defense. She spent the last 60 years in Puget Sound with only 2 owners during that time. She returned to the east coast in April 2017. MAH JONG was originally owned by Gilbert M. Grosvenor, Hovey Freeman, and Mike Merle-Smith. The maiden voyage was chronicled in a 48-page article in the December, 1958 issue of National Geographic. The vessel was sailed from Hong Kong, through the Suez Canal and through the Aegean Sea, stopping at Rhodes, Crete, Turkey and Greece. An extensive rebuild of MAH JONG was completed in June 2017 by Gannon & Benjamin in Vineyard Haven, with spars by Myles Therlow and sails by Ben Sperry. A redesign and rebuild was completed with new deck, dog house, trunk cabin, and all new interior. This was essentially Ross Gannon’s project but almost all of the employees contributed to the design and execution. Posted in News on July 24, 2017.